New racing partnership in support of NASCAR’s Drive for Diversity program FORT KNOX, Ky. (April 29, 2011) – The U.S. Army announced today a partnership with Revolution Racing and NASCAR’s Drive for Diversity (D4D) program for the 2011 season. During the upcoming racing campaign, the Army will serve as one of the primary sponsors for Revolution Racing in NASCAR’s K&N Pro Series races and as an associate sponsor for the entire roster of Revolution Racing drivers in both the K&N Pro Series and the NASCAR Whelen All-American Series. “The Army is proud to join Revolution Racing and NASCAR in sharing with America’s youth the many opportunities available to them whether through education, in motorsports or through service to the Nation as an Army Strong Soldier,” said Lt. Gen. Benjamin C. Freakley, commander of the U.S. Army Accessions Command. “Our Army offers many opportunities for young Americans to pursue an education and to become leaders both in uniform and back in their hometowns. Our shared values and commitment to America’s youth make this a great partnership.” As part of the new partnership, Revolution Racing leadership and drivers will join the Army’s efforts in reaching young Americans and their influencers about the many education and leadership opportunities available in the Army. The Army will be a part of NASCAR’s Fueling Your Dreams Tour presented by Revolution Racing, an interactive display area that visits NASCAR and K&N Pro Series races, local high schools and colleges, and other multicultural events across the country. The interactive assets and speaker panels provide young Americans an opportunity to learn more about the career options and leadership opportunities within both NASCAR and the Army. “We are very excited about our partnership with the U.S. Army,” said Max Siegel, chief executive officer, Revolution Racing. “Revolution Racing’s commitment to empowerment, education, opportunity and positive change is perfectly aligned with the values of the Army. The Army’s support of Revolution Racing clearly demonstrates their strong commitment to our nation’s youth and cultural diversity.” Revolution Racing joins the U.S. Army Racing family which consists of Tony Schumacher, driver of the U.S. Army NHRA Top Fuel dragster, and Antron Brown of Don Schumacher Racing, along with Ryan Newman, who pilots the NASCAR Sprint Cup Series No. 39 U.S. Army Chevy, and Tony Stewart of Stewart-Haas Racing. The Army team of drivers represent more than one million brave Army Strong Soldiers, and give the men and women who serve this country a race team to be proud of. The motorsports program also provides opportunities for the Army to interact with prospects and influencers, and assists recruiters in building an all-volunteer force for our Nation. Revolution Racing, owned by former Dale Earnhardt, Inc. executives Max Siegel and John Story, exists to provide opportunities in NASCAR for minorities and females, fielding four teams in the NASCAR K&N Pro Series, six teams in the NASCAR Whelen All-American Series, multiple youth racing teams and a NASCAR pit crew development program. It brings together championship caliber executives, competition staff and equipment in a unique, academy-style environment. Drivers on the 2010 Revolution Racing team enjoyed the best on-track season in the history of the Drive for Diversity program, earning four victories, 42 top-five finishes and 80 top 10s in 141 starts. Each team is part of NASCAR’s Drive for Diversity program, now in its eighth season. 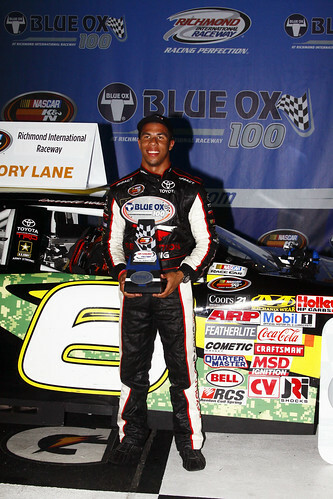 The 2011 season has started on a winning note for Revolution Racing with driver Darrell Wallace Jr. capturing a victory in the U.S. Army-sponsored car in Thursday night’s K&N Pro Series East race at Richmond International Raceway. “NASCAR is proud of the long standing bond between our sport and the U.S. Army,” said Marcus Jadotte, vice president, NASCAR Public Affairs and Multicultural Development. “The Army’s sponsorship of Revolution Racing speaks to our organizations’ shared values.” The Drive for Diversity program has been successful in creating meaningful opportunities for minority and female competitors. The program helps to further diversify NASCAR’s participant and audience base. The program has seen continuous growth since its inception in 2004. About U.S. Army Accessions Command The U.S. Army Accessions Command (USAAC), a subordinate command of U.S. Army Training and Doctrine Command, meets the human resource needs of the Army by transforming volunteers into officers, warrant officers, and enlisted Soldiers. In providing the force, the 18,391 men and women of Accessions Command prepare these future Soldiers and leaders for their initial military training. Commanded by Lt. Gen. Benjamin C. Freakley, USAAC is located at Fort Knox, Ky.
After a tight battle at the front, Darrell Wallace Jr. wrestled the lead away from Max Gresham for the final time on Lap 79 and held on to win the inaugural Blue Ox 100 NASCAR K&N Pro Series East race at Richmond International Raceway. Wallace, from Mobile, Ala., gained the third victory in just his 13th career start in the K&N Pro Series East. He took the lead from Gresham for the first time on Lap 55, and the two later swapped it following a restart on Lap 78, and for the decisive time on Lap 79. “We just had to be patient, and be there at about halfway,” Wallace said. “[Max] Gresham was pretty strong, and I think we just a little bit better car and a better line, and we just took it away from him.” Wallace pilots the No. 6 U.S. Army Toyota for Revolution Racing and Drive for Diversity. He gained two wins as a rookie in 2010, and has finished in the top 10 in all but three of his career starts. Brett Moffitt wound up second with Corey LaJoie, Gresham and Alex Bowman in the top five. For LaJoie, it was his fifth career top-10 finish, all of which have come at tracks in which NASCAR’s national series compete. “[Kevin] Harvick came up and talked to me before the race and gave me tips on the line,” LaJoie said. “I can’t tell my speed secrets, but another caution and we might have had it. He gave me some really useful tips that I didn’t even pick up on in practice. I didn’t realize what to do, so I really appreciate that.” For Bowman, it was his third top-10 finish in as many starts to begin his K&N Pro Series career. The rest of the top 10 was Jason Bowles, Michael Cherry, Ryan Blaney, Sergio Peña and Matt DiBenedetto. The Blue Ox 100 marked the K&N Pro Series East debuts for Blaney, the son of NASCAR Sprint Cup Series driver Dave Blaney, and action sports superstar Travis Pastrana. Pastrana finished 33rd in the event. With the win, Wallace now leads the season standings after three races by 26 points on teammate Peña. Wallace ended up leading a race-high 55 laps with Gresham the other 45. The race was slowed by just two cautions. There was a 1:48 red flag delay for rain. It can be seen on SPEED on Thursday, May 19. The K&N Pro Series East will next be in action when it is joined by the K&N Pro Series West in the annual East-West Challenge presented by Tompkins Industries at Iowa Speedway on May 21. Win Marks Third D4D Victory in Last 12 Series Races SOUTH BOSTON, Va. (April 17, 2011) – Just more than a year after exploding onto the NASCAR scene with a second-place finish in his NASCAR K&N Series debut in the NASCAR Toyota All-Star Showdown at Irwindale, Sergio Peña grabbed his first series victory in the South Boston 150. 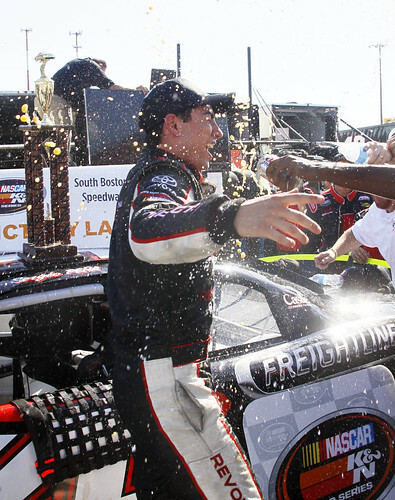 Peña, driving the Freightliner Toyota as part of the NASCAR Drive for Diversity program, won the second race of the NASCAR K&N Pro Series East season. It marked the third victory in 12 NASCAR K&N Series races for Revolution Racing over the last two seasons. 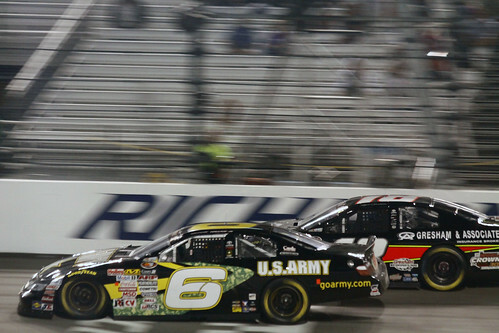 Teammates Ryan Gifford, driving the TRD Toyota Camry, and Darrell Wallace Jr., driving the U.S. Army entry, took home fifth- and sixth-place finishes respectively, giving Revolution Racing three of the top-six positions in the tightly contested race. Michael Cherry, driving the Revolution Racing Fueling Your Dreams Toyota Camry, was involved in several accidents including one with then-race-leader Brett Moffitt with nine laps remaining, giving Peña the lead on the race’s final restart with four laps remaining. Cherry spun alone in turn four and Moffitt could not stop collecting Cherry’s Toyota. Peña held off Matt DiBenedetto, Max Gresham and Coleman Pressley for the win. Peña took over the lead in the NASCAR K&N Pro Series East points standing by one point over Coleman Pressley. Wallace is fourth (21 points behind Peña), Gifford is seventh (minus 52) and Cherry is 17th (125 points down). Wallace Jr, last year’s NASCAR K&N Pro Series rookie of the year, puwon the pole with Peña qualifying third, Cherry sixth and Gifford 12th. “This is a great feeling,” Peña said. “I don’t know what happened to Brett Moffitt there, but unfortunately for him he wasn’t able to finish the race, but he was definitely the car to beat. Luckily I was there to pounce on it and take away the win.” The South Boston 150 can be seen on Speed TV Thursday at 6 p.m. (ET).